This article analyzes the political reach and effects that diverse religious discourses and practices are having in Colombia’s current “peacebuilding” historical juncture. Examining two specific case studies of entanglements of the religious and the juridical, it traces pragmatically differential ways in which the complexes relations between religiosity, statecraft and violence can be played out in Colombia’s “post-agreement” historical epoch. It argues that our analysis of these case studies should move away from secularism, as a normative stance and an interpretative grid, towards a conceptualization of different forms of effective imbrication between the religious, the political and the juridical, that the understanding of the theologico-political in the works of Schmitt, Derrida and Foucault, might help us to think through. In this way we could better evaluate the contrasting political rationalities of diverse pastoral practices oriented by different figures of the theologico-political, and their social and political effects. Este artículo analiza los alcances y efectos políticos que diversos discursos y prácticas religiosas están teniendo en la actual coyuntura histórica de la “construcción de paz” en Colombia. Examina dos estudios de caso específicos de imbricaciones entre lo religioso y lo jurídico para trazar desde allí modos pragmáticamente diferenciados en los cuales pueden darse las complejas relaciones entre religiosidad, estatalidad y violencia en la Colombia del “post-acuerdo”. Se argumenta que nuestros análisis de estos casos deben ir más allá del secularismo, como marco normativo y esquema interpretativo, y moverse hacia una conceptualización más cuidadosa de las diferentes formas de entrecruzamiento entre lo religioso, lo político y lo jurídico. Para avanzar en esta dirección se propone examinar los esfuerzos por parte de Schmitt, Derrida y Foucault de caracterizar una configuración teológico-política que aún persistiría en el marco de los Estados que se pretenden seculares. De esta manera, podríamos entender y evaluar mejor diversas prácticas pastorales marcadamente diferentes, que se orientan por figuras de lo teológico-político no sólo distintas sino incluso antagónicas, y los efectos e implicaciones sociales y políticos de estas prácticas. Este artigo analisa os alcances e efeitos políticos que diversos discursos e práticas religiosas têm na atual conjuntura histórica da “construção de paz” na Colômbia. Examinam-se dois estudos de caso específicos de imbricações entre o religioso e o jurídico para traçar, a partir disso, modos pragmaticamente diferenciados nos quais podem ocorrer as complexas relações entre religiosidade, estatalidade e violência na Colômbia do “pós-acordo”. Argumenta-se que nossas análises desses casos devem ir além do secularismo, como contexto normativo e esquema interpretativo, e mover-se em direção a uma conceitualização mais cuidadosa das diferentes formas de entrecruzamento do religioso, do político e do jurídico. Para avançar nesse sentido, propõe-se examinar os esforços por parte de Schmitt, Derrida e Foucault em caracterizar uma configuração teológico-política que ainda persistiria no contexto dos Estados que se pretendem seculares. Dessa maneira, poderíamos entender e avaliar melhor diversas práticas pastorais marcadamente diferentes, que se orientam por figuras do teológico-político não somente distintas como, inclusive, antagônicas, e os efeitos e implicações sociais e políticos dessas práticas. In the first section of this article, I map certain debates in contemporary interdisciplinary theorizations of the entanglements between forms of religiosity and forms of political agency. This mapping leads to questions provoked by these debates, questions that the analysis of the two case studies that follow seeks to explore. 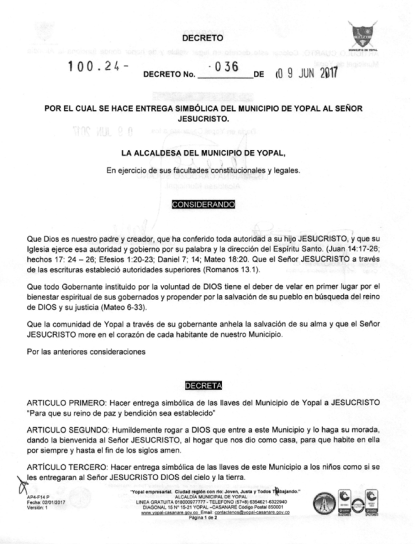 The second section discusses a controversial incident, related to the defiant gesture of two mayors in remote rural towns of Colombia, who decided, in June of 2017, to consecrate their municipalities to Jesus Christ via juridical decrees. This is the occasion for characterizing secularism as the normative stance and grid of intelligibility which are absolutely dominant in our country in framing the terms of the debate about the relation between religion and politics at the level of public opinion (opinion makers, academics, public intellectuals, government officials); and more important, an occasion for starting to problematize and critically interrogate this dominant framework of interpretation and political evaluation. The third and fourth sections set forth a contrast between two different “theologico-political” structures at place in two scenarios where religious practices and political or juridical actions done in the orbit of the State imbricate. The first scenario is the one just mentioned, the second one is the civic strike in Buenaventura, Colombia’s main Pacific Coast port, and the quotation that serves as an epigraph of this article is meant to illustrate the intense and unequivocal involvement in the strike of the regional hierarchy of the Catholic Church. We face here an imbrication of the religious and the political which, unlike the previous one, was largely unnoticed. In order to understand these significantly different “theologico-political” structures it is necessary to re-conceptualize what does it take for a religious discourse or practice to inscribe itself in the law. What does it mean for a form of religiosity to be written, inscribed, in the law? This reconceptualization, we argue, has to move beyond the mainstream version that we owe to political liberalism, whose conception of this “inscription” is extremely limited and insufficient. This article undertakes this task taking resources from the also very different accounts of a certain “theologico-political” register that would still persist in the secular liberal State, according to Schmitt, Derrida and Foucault. I do not conceive of the interplay between these philosophic-theoretical perspectives and the study of specific case studies in terms of the application of a theoretical grid upon an empirical historical material. Rather, what is at stake is a mutual interpellation that confronts the theoretical-philosophical tools, puts them into question, and calls for their adjustment, and re-elaboration. And one that interrogates the historical material of the case studies in its presumed “evidence,” analyzing it comparatively, so as to reconfigure and displace it; perhaps allowing it to appear in a different light, making itself intelligible otherwise. The perspective on the questions emerging from the entanglements between the religious and the political which I elaborate throughout this paper, resonates in important ways with issues raised decades ago by Jean and John Comaroff in their fascinating and in so many ways inspiring book Of Revelation and Revolution (1991). Let us recall that they open their anthropological history of Christian missions in South Africa’s colonial experience, emphasizing the political and social ambivalence of Christianity as a symbolic assemblage, in this history of complex encounters. They evoke this ambivalence by juxtaposing two scenes. First, the building of a missionary school of the Dutch Reformed Church (DRC) in the territory of the Tswana tribe around 1960, despite the opposition of the local inhabitants, an imposition of the colonial State which deployed a series of arbitrary measures to bypass the opinions and decisions of the native communities, who showed a keen awareness of the ideological and political power of the church. Second, an incident in 1988, when the police repressed an anti-apartheid demonstration, led by Desmond Tutu and other religious leaders, and the participants responded to their brutality by singing the hymn of their resistance movement, one densely charged with Christian terms and symbols, that was actually composed in a Christian mission in the late 19th century. For the Comaroffs, the conclusion these contrasting ethnographic vignettes leads to is not simply that religion was used in different ways by the opposing sides of the conflict in South Africa. But rather, that the colonial encounter and the relations of power and forms of violence deployed in it, have always implied a complex dispute regarding how the consciences of people are formed, how they come to inhabit and live the world in a certain way. And that in this respect Christianity as a dense texture of religious affects, symbols, and experiences has played out as a distinctive materiality in this dispute over the shaping of a nation. This dispute, they stress, is at once about material conditions of life, as it is about processes of signification through which the social is constituted and people’s way of inhabiting and understanding their social world is shaped (Comaroff and Comaroff 1991, 4). It is this perspective of religion as a profoundly ambivalent, and powerful, signifying force that this paper actualizes. A force that requires us to rethink the processes of ethical and political subjectivation, and the types of agency that are configured in our own scenes of social and political conflict, defying perhaps dominant conceptual categories and interpretative grids. On the other hand, this paper also opens a conversation with attempts to historically contextualize the tense, changing, and diversified relations between Church and State in Latin America (Lemaitre 2017). Without being able to undertake this dialogue thoroughly, it nonetheless seeks to contribute to a better understanding of those diversified and even opposed forces, with significantly different juridical and political implications, that nowadays traverse the field of the political salience and influence of religious practices, discourses and institutions in that convolutedly heterogeneous camp of Latin American Christianities. Since the notable emergence of religions as decisive forces in political conflicts played out throughout the globe (Casanova 1994), the analysis of the problems arising from this phenomenon have mostly decanted in two different modes of intelligibility of the relation between the religious and the political. On the one hand, political liberalism re-assessed itself in order to uphold the neutrality of the State vis-à-vis the diverse religious communities while, at the same time, it made efforts to define the normative conditions under which religious discourses and practices could make their appearance in the “public sphere” of modern constitutional democracies, contributing to its plurality without infringing upon the State’s secular character (Rawls 2001; Taylor 2011). On the other hand, partly in response to the impotency or negligence of the political culture associated to this liberal conception of the State to counteract the increasing contagion of islamophobic attitudes and affects throughout the United States and Europe, in the wake of the episodes of suicide bombings, a different mode of intelligibility of the relation between the religious and the political started to configure itself. This was a perspective profoundly critical of the normative stance of secularism, the assumptions underpinning it, and its ethical and political effects. Here, “secularism” is no longer conceived of as a normative demand of how institutions and citizenship in modern democracies ought to be in order to further the values of equality, freedom and social cohesion; but rather, as a set of discursive and material techniques of power constitutive of the historical development of modern States in the global North, and immanent to their production of specific forms of social and economic inclusion and exclusion, and their deployment of specific forms of ethnocentric violence against racially and culturally differentiated minorities (Asad 2003a; Mahmood 2009a; 2009b). The political commitment that has animated this latter perspective has been the necessity to resist these subtle but incisive forms of structural violence. The debates between these two antagonistic perspectives have proved to be very productive, and yet are perhaps reaching the threshold of their limitations. Among many other important issues, they have encouraged a critical analysis of certain semantic procedures and grids of intelligibility built-in in the liberal State’s self-understanding of its secular character. For example, they have motivated a critical reflection on a series of dichotomies, like that between the private and the public; or between the public in the sense of the relations and encounters among people in so called “civil society,” and the State as a social sphere that is supposed to be neatly demarcated from the latter; or between rational deliberation and affective subjection; or between (techno-scientific) reason and (mythical or religious) unreason. These conceptual dichotomies are still constitutive of secularism as a normative paradigm upheld, even if redefined, by political liberalism. They carry specific ways in which “religion,” “ethics,” “citizenship,” the “State” itself, cultural or social “difference,” can and ought to be understood and experienced (Asad 2003). Hence, they deploy a semantic regime that puts into play complex and subtle forms of violence, relations of power, exclusion, marginalization and inequality, by promoting certain forms of life while disabling others. Yet there is a question that remains unanswered in these critical and deconstructive theoretical approaches. Since we must take a critical distance from the way “secularism” operates in modern liberal States as an answer to the social problem regarding how to accomplish unity in diversity, what other ways of conceiving the problem of the construction of a plural common can emerge from forms of religiosity that perhaps resist the frame of intelligibility and evaluation that “secularism” as a normative stance provides? The first aporia emerges from the tendency in these critical genealogies of “secularism” to emphasize the entanglements between neoliberalism as a technology and rationality of government and liberalism as a normative paradigm -of which secularism is an integral part. When it becomes too emphatic, this tendency makes it difficult to assess the links between neoliberal forms of governmentality and certain forms of evangelical spirituality that seem nowadays to defy political liberalism’s normative correctness by unscrupulously deploying overtly xenophobic (in the United States) or homophobic (in Colombia) political positions. And to defy it also by advocating these positions in the public sphere in an inflammatory theological and political militancy, that at times seems no longer to hold any regards towards the presumed “secular” character of the State in modern democracies. Do these at once religious and political attitudes, which explicitly rage against the plurality of ways of life and endanger it from a certain religious zeal, demand a more unequivocal defense of “secularism” and, more generally, of political liberalism’s core values, as some have argued? (Brown 2006). But, how could one unhinge in such a way liberalism’s political culture and the semantic horizon it has deployed as an hegemonic one for so long (even if this hegemony is now under threat), without attending to the problematical ethical and political effects that it has had in the marginalization, invisibilization and exposure to diverse forms of violence experienced by racially, ethnically, and culturally diverse social groups in the functioning of the liberal State’s rule-of-law? Hasn’t there been an internal and constitutive relation between the “correct” and “multicultural” neoliberal State, and this other much more defiantly discriminatory version of it, as others have argued? (Asad 2006; Mellino 2016). The second aporia emerges from the question whether the stark division between civil society and the State’s institutions as two clearly distinct realms of the “public sphere” is still sustainable. This division has allowed political liberalism to defend the intervention of religion in the restricted public sphere (civil society), while banning it from the State’s institutions in the name of the guarantee of plurality and freedom of cult. But it seems to be descriptively and analytically untenable and unproductive in complex political processes like the one’s experienced in recent years in Latin America in which alternative State projects have emerged under the impulse of long held trajectories of regional political forms of mobilization and organization “from below,” and their eventual articulation. Even more, when many of these processes of political mobilization of marginalized communities have staged and performed themselves under the influence of religious practices and discourses (Iranzo and Manrique 2015; Pinto 2015). The radical porosity between processes of political militancy from below in Latin America at the level of what liberalism would call “civil society”, and the configuration of alternative State techniques and forms of governmentality, seems to put into question the viability or even desirability of the State’s unconditional “neutrality” with respect to organized forms of religiosity upheld by “secularism” as a normative paradigm, even in its most multicultural versions. Thus, taking into account these two aporias, this paper sustains a close dialogue with the normative liberal and the critical genealogical approaches to the problems raised by the shifting imbrications between religions and politics in the contemporary post-secular world, but also by the necessity of going beyond the grids of intelligibility that these two approaches to the problem of “secularism” provide. First, by asking (always closely attending to the interpellation of events in the current political landscape in Colombia which will be described below): What is the entanglement between neoliberalism as a set of government techniques (and the semantic and epistemological horizon that enables them), and the sometimes defiant, discriminatory and anti-secularist forms of conservative evangelicalism that have recently showed their political/electoral force in diverse scenes of political conflict throughout the globe (including Colombia’s “post-agreement” historical era)? And second, by asking: How can we understand the different modes of inscription of religious discourses and practices associated to grassroots processes of political mobilization and organization “from below” in concrete State and government techniques, beyond the conceptual and evaluative schema of “secularism” and its semantic procedures (the dichotomies between private/public, civil society/State, rational deliberation/irrational affect, etcetera.)? To deal with these questions, I analyze two recent events in Colombia’s social and political landscape. In June of 2017 the debate regarding the relation between religion and politics gained momentarily an abrupt visibility in mainstream media and social networks in Colombia. This was on the occasion of the defiant gesture of two mayors of Colombian remote rural towns who decided to offer their municipalities to Jesus Christ via governmental decrees and in public official acts. Against these defiant gestures, a secularist type of indignation against them irrupted vehemently in the public sphere invoking the secular character of the State as a necessary safeguard against actions such as this, judged to be not only politically dangerous, but also illegal and unconstitutional. This polemic, short lived but bitter, did not deploy itself out of the blue. The gestures were performatively abrupt and unexpected, but are symptomatic of an increasing overt militancy of conservative evangelical churches in the arena of Colombia’s electoral politics. Around half a year before these unusual but calculated performances of local State sovereignty, the entire country had a rather numbing attestation of the influence of this militancy at the national level, and in a very sensitive electoral process. The role of these sectors of conservative evangelical churches was decisive in the triumph of the “No” against the peace agreements signed by the government and the FARC, the insurgency in the process of laying down their arms, in a referendum whose results shocked the country. In the perplexity generated by this shock, exhilarating for the opponents and heartbreaking for the supporters of the peace process, the electoral force of the evangelical churches showed itself as having an unexpected, and yet relentless reach. The defiant juridical decrees in remote rural towns that we are describing here were perceived as an evocative reminder of this force, a nuanced understanding of which requires historical, sociological and even statistical analyses which remain still, and hopefully, to come. The angle from which I approach these juridical performances is neither historical nor sociological, given the limited scope of this article. Instead, my concern is the symbolic or performative force deployed in them, and the issues they raise about the passages between language, law and religion. About the forms of ethical and political commitment that they mobilize, and the vocabularies and evaluative schemes activated by the secularist defenders of the “neutrality” of the State, and their implications. An observer academically trained in the debates on “post-secularity,” could not help to feel somehow torn apart: on the one hand, sympathizing with the urge to be vigilant and critical against this defiant conservative evangelicalism, which has become a powerful political force not only in Colombia (as the rejection of the peace agreement showed) but also in the United States (Smilde 2007; Sutton 2014). But, on the other hand, such an observer could not stop short of interrogating the problematic theoretical and political assumptions that are taken as self-evident in the mainstream liberal criticism against such defiant performances: 1) the assumption regarding the presumed “neutrality” of the law (as fact or as regulatory ideal); 2) a certain way of tracing the frontier between the private and the public, and the normative appeal to the necessarily “private” character of religion, and 3) the assumption constitutive of the “deliberative” type of political liberalism that the language of the law should be a language equally shared by all in a common horizon of meaning and, as such, the basis of the social conceived of as contract or consensus. These events made evident that the irruption of overt religious language in the language of the law carried forth a certain kind of violence. This violence was most likely calculated on the part of the evangelical Christian town mayors just mentioned, and their calculation proved to be right: their defiant gesture was regarded as “offensive,” and in this display of force caught the attention of the mass-media and became a trend in social networks for several days. The secularist reaction was only part of this mass media iteration and ultimately contributed to it. But the question that few asked was: What kind of force, or violence, is hence exerted by this overt and explicit appearance of religious vocabulary in the writing of the law? How to understand or evaluate this specific form of linguistic violence and its capacity to generate such an affective contagion of anger and indignation, especially among the urban and educated elites? The answer implicit in the secularist defenders of the neutral character of the State does not stand up to a critical examination. The daily workings of technocratic forms of government pass by unnoticed, and yet show the weaknesses of the three premises stated above on which this secularist criticism is articulated. The modern democratic State -the rule of law-, seen not as a shared juridical order contractually grounded in the will of the people but as a set of specific techniques of government performed through specialized technical or administrative forms of knowledge, implies that the language in which the law is written, but more importantly, in which the written law governs peoples’ way of living (for example in the design of public policy), is most of the times violent in this way. It implies the forceful imposition of an epistemic regime in which the lawmakers and their teams of experts (Mitchell 2002) have an authoritative linguistic prerogative to “write” the law in a language that is not shared by all; and that, actually, tends to render inaudible other “languages,” other forms of inhabiting, experiencing, and understanding the world, having thus a disabling effect over the forms of life that are configured in them. This is the epistemic and semantic dispute that is at stake in the diverse popular local referendums around the country through which the people have decided against the arrival of vast and large-scale mining or energy exploitation projects, standing for the defense of agricultural practices, forms of life, specific relations to the territory and the accumulated forms of knowledge and intelligibility in which these relations are configured. The current Colombian government’s efforts to disable the juridical weight of this local popular electoral processes organized by the communities in diverse rural regions of Colombia, shows its urge to have the prerogative to impose the language (as structure of meaning and intelligibility) on which the law should be written and public policy decided upon: a specific conception of economic growth and development, which contends with other experiences and forms of knowledge of the territory, and their social texture, for instance. Thus, in technocracy as a daily modus operandi of the State normatively legitimated as the “rule of law,” this violence of the imposition of a specific language in the writing of the law, one that is not neutral and that imposes itself in complex relations of power over others, never receives such a collective and affectively intense refusal by the type of liberal well educated intellectuals that become crusaders of secularism in response to episodes as the ones described above; it rather goes by mostly inadvertently if not approvingly for them. This raises several questions in turn: What is specific about this linguistic violence exerted through the appearance of religious vocabulary in the writing of the law? This question partakes of a wider one: How to think the relation between religion, violence and law in a historical epoch that has been regarded as post-secular? (Shakman 2015). The limitation of the secularist interpretation of the violence performed by the explicit appearance of religious vocabulary, and religious considerations in the writing of the law in these excessive, uncommon and disturbing decrees that we have just mentioned, has to do with a very restricted understanding of the “inscription” of the religious in the law’s text. It is certainly the case that the appearance of biblical language in the State’s law brings forth the question regarding the implications of a sectarian, particularistic, even exceptional and highly idiosyncratic language, not necessarily shared, meaningful or intelligible for all, in the text of the law. There is a “violence” denounced here from the side of the secularist type of criticism insofar as this language is discriminatory and excluding towards all those who do not share it. And hence, the neutral character of the law, as ideally grounded in processes of deliberation undertaken in the adequate institutional instances that lead to a consensus in virtue of which the language of the law is regarded as “common” to all people under its authority, would be compromised. But to reduce this linguistic or semantic violence to these instances of a scandalous or bizarre inscription of religious (biblical) words in the text of the law, is to bypass the extent to which this type of semantic violence is constitutive and integral to the law’s position and force, as such. And furthermore, it is to bypass that this violence is more incisive and its operation more effective and far reaching when it is less recognizable, when it has stabilized itself to the point of becoming routine, taken for granted and unnoticed. This is Derrida’s point when he conceptualizes an alternative way of conceiving the relation between language and law beyond the two main traditions in western political and juridical theory: the “deliberative” and the “epistocratic” one. The law as consensus reached through deliberation, and the law as enunciated from an epistemologically superior and authorized perspective. Both of these conceptions tend to naturalize, and disavow, this semantic violence that consists in the stabilization or imposition of certain regimes of meaning and intelligibility that disable others. The first by assuming that a consensus reached through deliberation becomes the “common” qua neutral language of the law, hence normalizing and disavowing the extent to which this “common” is precisely a conflicted scene of dispute between idioms, frameworks of intelligibility and the forms of life associated to them; a scene where some have imposed themselves over others in a play of forces. And the second one, the “epistocratic” conception, by assuming that there is a transcendental “ground” or criteria external to this dispute, in virtue of which one of these idioms or regimes of meaning is authorized and validated as epistemologically superior than others. In Derrida’s terms, this latter is the assumption of a “metalanguage” that would validate as more grounded or authoritative than others, the structure of meaning in which the law makes itself intelligible: “No justificatory discourse could or should ensure the role of metalanguage in relation to the performativity of institutive language […]” (Derrida 2002, 241). What Derrida calls the “mystical foundation of authority” is precisely a way out from these two alternatives aimed at deploying a critical force against the type of naturalization of the law’s constitutive semantic violence, and its ethico-political normalizing effects. But in this respect, this “mystical” or religious force, which is irreducible even for the case of the presumed secular rule-of-law written in the language of technical jurisprudence and perhaps in the language of scientific expertise (persisting here in a more insidious precisely because much less conspicuous form), is inscribed in the law not because of the overt appearance of a highly idiosyncratic vocabulary, but in the form of an inexpugnable silence. The unexplainable and unjustifiable arbitrariness at stake in the dominance of a semantic or epistemic regime with all its effects of enabling certain forms of life, of conduct and of sensibility, and disabling, silencing or rendering others ineffective. Derrida’s account reveals the limited conception of the “inscription” of the religious in the language of the law at play in the secularistic type of indignant criticism against these evangelical religious zealots: that this “inscription” need not to be that of the appearance of religious explicit vocabulary in the text of the law. It is the occasion also for introducing into this conversation the at least intriguing lead of those accounts of the modern liberal State that most powerfully insist on the persistence in its very structure, despite its self-proclaimed and assumed “secular” character, of a certain religious register. One that, differentially conceptualized in each case, is nonetheless implicated in the performance of a certain kind of “violence” inherent to the rule of law as such: what Derrida calls a semantic violence; Foucault, a subjectifying and individualizing power; and Schmitt, the violence of the sovereign decision on the exception. Source: Alcaldía de Yopal 2017. The linguistic violence performed in this defiant decree is hence not a transgression of a limit, the limit of the adequate and appropriate presumed neutral language in which the law ought to be written. Rather, it is an excessive mise-en-scéne of the semantic violence derived from the ineludible fact that the language of the law is never equally shared, nor common to all (Derrida 2002). The difference that this excess marks in this juridical act, is however not just the rendering manifest of a semantic “violence” that would otherwise remain invisible, and that in fact goes mostly unnoticed in the day-to-day operation of the State’s apparatus. And there is something else that this secularist reaction deafly bypasses, and this is the affective texture that this juridical act mobilizes and puts into play: anxiety, fear, reverence, hope, care and anger, to mention just a few ridges of this affective constellation. To make this affective texture felt vividly is one of the most notable aspects that the use of explicit religious vocabulary in this juridical act does. By condemning it as an inadmissible transgression to the secular character of the State, the secularist criticism is also somehow condemning this affective intensity as such, without pondering it, without evaluating its structure, inflexion, implications and effects. By doing so, it is as if the language of the law should be devoid of affect, as if this affective intensity contaminated or damaged the law; but this sine ira et studio, as Weber would say, is itself a very specific affective structure with its own implications and effects. In order to elaborate a bit on this issue of the affective intensities put at play by the religiously explicit writing of the law here at stake, it is worth evoking for a moment Schmitt’s theory of sovereignty. As we will clarify below, there is certainly an enormous difference between Derrida’s analysis of the instituting semantic violence at play in the very position of the law, on the one hand, and Schmitt’s concept of sovereignty as the decision on the exception, on the other. These differences open totally divergent ethical and political implications, possibilities and consequences. Nonetheless there are certainly important lines of convergence. Among them, the way in which the figure of the theologico-political that takes form in Schmitt’s thought is one that tends to destabilize the dichotomy between rationality and affectivity, between the abstract conceptual and the real experiential concrete (the general and the particular), and between the normal order and the extraordinary “disturbance.” In this precise sense Schmitt’s reflection operates as a “deconstructive” exercise -in the Nietzschean/Derridian sense of this term, as the putting into question of an schema of hierarchical values that divide the world into two, and the critical assessment of the perspective that this schema brings forth. Since the normative stance of secularism as the need to warrant the neutrality or even “purity” of the State vis-à-vis religious vocabulary, operates entirely in these hierarchical dichotomies (the particular that is opposed to the general and contaminates it; the affective that is opposed to the rational and threatens it, etcetera), by destabilizing them in their respective and very different, I insist, accounts of what gives the rule of law its “force,” both Schmitt and Derrida make tremble the metaphysical schema (again in the precise Nietzschean/Derridian sense of the term), on which this normative stance finds its ground. In this respect, one of the most interesting aspects of Schmitt’s powerful analysis on the concept of “sovereignty” is how he highlights the ineradicable “affectivity” that traverses the law. This affectivity has to do with one of the paths undertaken by Schmitt to characterize the necessity of the “exception” with respect to the juridical order, a path that involves what I would call an existential or ontological insight: the ineludible anxiety and uncertainty of the human thrownness in the natural and historical worlds. It is, hence, an affect of anxiety and fear, counteracted by a protective salvific affect, what is at stake in the sovereign’s decision, according to Schmittt’s account. One perceives this affective modulation in the infamous juridical decree we have been discussing. There is something in it, then, that puts into play the sovereign decision on the exception that Schmitt conceptualizes. Its affective modulation is not, certainly, its juridical effectiveness in the institution of a social order (the decree was promptly judged as unconstitutional and disabled from its juridical binding force). The dislocation of the bizarre decree with respect to the prevailing semantic space that the liberal State’s rule of law breathes from, might also be an indication that this particular inscription of religious language in the language of the law, brings to the fore something within the rule of law that tends to be denied or disavowed: a certain affective “salvific” configuration which is the rendering immune of a people’s health vis-à-vis a threatening unknown “other” that endangers it in a terrifying way. But in this immunitarian affectivity the religious zealots and the secularist critiques seem to coincide, partaking both equally of it: from each of these perspectives the terrible and terrifying “other” appears as a menace that ought to be kept at bay. To the secularists the evangelical zealots that threaten the secular purity of the rule of law, and can make it tremble with the irruption of the exception that suspends its normality and presumed neutrality. To the religious zealots, the secularists’ pride that leads to the godlessness of an empty law. Each monster attempts to defend the people’s health from the other’s attack, through the sovereign State’s force. In both gestures, “order in the juristic sense still prevails even if it is not of the ordinary kind” (Schmitt 2005, 12-13; author’s emphasis). Here Schmitt seems to come closest to Derrida’s perspective, in a way, and hence it is precisely here that their approaches also depart most dramatically. Derrida also insists that the “mystical” character of the law’s authority, of its force, has to do with the way its functioning depends on a previously stabilized semantic “order” whose reality, and whose performative power to produce certain type of social relations, hierarchies, inclusions and exclusions, etcetera, is arbitrary, is un-grounded, cannot be justified as legitimate or illegitimate. It is an extra moral and extra juridical “violence” constitutive of the horizons of meaning we inhabit and have incorporated; “there is no metalanguage” to justify this semantic violence in virtue of which something like a social order institutes itself, Derrida says. Therefore, Derrida’s insight here is partially very similar to Schmitt’s. There is no law in chaos. The recognition, authorization and functioning of the law requires a somewhat stable social and historical order, at once semantic and social, epistemic and political. The law requires such an order as its condition of possibility but the force through which such an order imposes itself is extra-legal, extra-juridical. Schmitt calls this force, the “sovereign” decision, hence circumscribing it to the notions of the power of a will, and the identity of personhood. The sovereign is God’s “representative” on earth, he says so repeatedly, hence his or her sovereignty must hold a relation of resemblance with God as most powerful will and morally most magnificent figure of personhood. Derrida, on the other hand, doesn’t attribute this “decision” to one will and personhood, which for him would be still a (the?) supreme logocentric gesture: grounding this world’s order in a transcendental beyond or “ground;” or, to put in terms of his argument in “Force of Law”, grounding this instituting violence of the social in a “metalanguage,” which would be in this case theological, but a “metalanguage” which in the daily workings of the technocratic State’s rule of experts is the language not of theology, but of certain scientific and technical forms of expertise. For Derrida this instituting force or violence has to do with the impersonal character of historical becoming, with temporality as the mode of historical experience and its role in the consolidation (always fragile and always endangered) of the semantic space that allows for shared horizons of meaning on which social experience arises, and stabilizes itself. Derrida’s understanding of the “mystical” foundation of authority is, henceforth, radically anti-voluntaristic, and radically anti-personalist. But then there is also another consequence or implication of this profound abyss or disparity that arises between Schmitt’s and Derrida’s conception of the irreducible “theological,” in the former case, or “mystical,” in the latter, register of the juridical law’s force and authority: the radical disparity in the ethico-political effects of this notion. Whereas it is employed by Schmitt to defend and affirm a figure of responsibility tied to identity, sovereignty and inmunitary propriety (a zeal for what is most proper and one’s own when it is threatened), in the case of Derrida’s analysis it leads to a critical departure from this figure of sovereignty (which Derrida thinks of as the “ether” of metaphysics). This leads thus to the need of conceptualizing ethical and political responsibility away from this figure: in the experience of a decision traversed by aporia, by an irresolvable contradiction that situates the self in a condition of uncertainty, vulnerability, and division or dislocation from herself. Taking this into account, one has to make a distinction between these two performances of the instituting “violence,” irreducible, inescapable, that makes possible the space of a historically situated social order, in the deployment of the juridical law. The force of the sovereign decision, on the one hand; and on the other, the force of an impersonal historical becoming that dislocates the identity and power of the sovereign self and the figure of responsibility associated to it, which is unequivocally installed in the liberal figure of citizenship. Just two weeks before the mediatized, intense and yet very short lived scandal and polemics generated by these juridical performances of evangelical Christian majors in remote towns of the “deep” Colombia, another complex imbrication between religious practices and the State’s forms of governing was taking place by mid-May of 2017, having to do with the leading role of the catholic Church’s Diocese of Buenaventura, in a civic strike that massively brought people to the streets and paralyzed the region. The strike was organized in Colombia’s main pacific port, Buenaventura, a city that has suffered for too long conditions of extreme precariousness, insecurity, violence and extremely deficient and negligent delivery of basic public services. In this sense the city of Buenaventura is a symbol of the harsh conditions of poverty, and of armed and structural forms of violence that the inhabitants of Colombia’s pacific coast, mostly Afro and indigenous communities, have forever suffered in an inequitable relation with respect to the rest of the country. The intervention of the highest hierarchies of this region’s Catholic church, in a clear position of social and political intervention and leadership in the social street mobilization, the logistical organization, the political strategy (one very recognized and respected priest was one of the most visible spokesperson of the strike’s central committee), and the public defense of the protest’s legitimacy was hardly felt and went almost unnoticed in the mainstream media’s coverage of these events. It was, however, an intervention felt strongly and unequivocally by the people facing the strike’s hardships, which included acts of brutal police repression that resulted in injuries and incarcerations of protesters. There were certainly no secularist manifestations of indignation at the level of the “public opinion” and in social networks for the intrusion of religion in politics, or more precisely, in the sphere of public policy and legislation. And yet the role of leadership and support of these church authorities towards the strike is unequivocal both in terms of these Diocese’s public statements, and in terms of the people that were marching in the streets and encountering organizational and thematic workshops, in an articulation of different social movements and organizations that coalesced in the strike. One of the very few somewhat detailed news reports of the local Catholic Church’s involvement in the strike, coming out of the independent media outlet La Silla Vacía bore the title “The Church, the moral force of the pacific region’s strike” (Arenas 2017). Some of the testimonies of the people participating in the strike’s street protest or in its organizing central committee, show how powerful the guidance of the priests in a position of leadership in mobilizing people to the streets was, in calling for peaceful resistance, in even convoking people to counteract the irruptions of robbery and vandalism that occasionally arouse in certain critical moments, by building human chains to protect the establishments threatened to be looted. On the other hand, the effects of this strike, which lasted twenty-three days, in terms of a political collective action affecting the State’s practices of government were immense. The strike ended with a substantial agreement between the strike’s committee and the government, in which the latter committed itself to considerable budgetary investments in concrete actions regarding infrastructure, health and other basic services such as energy supply, education, and the conformation of a mixed instance with members of the strike’s committee and the government which will be in charge of a permanent oversight of this agreement’s compliance. The contrast between what made it and what not into the so-called “public opinion’s” debate vis-à-vis these two markedly contrasting imbrications of religious discourses and practices, and State decision-making scenarios, is stark. One would say that our prevailing and dominant schemas of analysis and evaluation of these imbrications are somewhat out of focus, or out of tune -and by “us” I refer to the mainstream liberal progressive intellectuals, journalists, academics and public officials that in a certain inertia uphold the “secularist” normative stance regarding the need of separation between religion and State decision making processes. On the one hand, so much ado about nothing; a small town’s juridical decree that would be two or three days later revoked without having much effect on techniques and practices of government affecting people’s livelihood, but perhaps having a much larger effect in soothing the good conscience and moral self-complacency of enlightened progressive opinion makers, academics, and government officials in urban centers.2 On the other hand, so much indifference towards how certain religious pastoral practices associated to the Catholic Church’s long dated work with socio-economically and culturally marginalized communities in Colombia’s Southern Pacific region, have come to gain a role of leadership and influence in processes of grassroots social and political mobilization. Processes capable of pressing the national government to acquire very concrete policy-making and budget investment commitments that could have significant effects on people’s livelihoods. But of course this initial way of describing the lack of focus or tune of certain prevailing schemas of analysis and evaluation of the imbrications between the religious and the political is only partially adequate and precise. The State as spectacle, the scene of the juridical defiant decrees, pretends to be also in its highly charged symbolic performances a form of government over people’s conducts. And one which obviously is also connected in complex and none fortuitous ways with certain government rationalities and techniques. On the other hand, the State is certainly not the main stage of appearance of the political influence of this Catholic pastoral work in the Colombian pacific region. This pastoral work has created strong alliances with diverse social movements and civil non-governmental organizations, and its social and political militancy takes place in what even the religious leaders associated to the strike refer to as “civil society”. And yet, two things need to be remarked on here: first, that in continuity with our argument interpreting the evangelical mayors’ defiant decrees, we need a more complex conceptualization of what does it mean for a religious discourse or practice to be “inscribed” in the State’s law, beyond the insufficient account of liberal secularism that reduces such an “inscription” to the overt and explicit appearance of religious language in the writing of the law. And secondly, as we know very clearly from Benjamin’s analysis, the general strike is an instance where a peculiar sort of law-making violence is deployed. The strike is a borderline instance in which the separation between “civil society” and the State’s legislative or governmental authority becomes profoundly destabilized. Hence political liberalism’s assignation of a “proper” public role for religions only at the level of civil society (Casanova 1994; Habermas 2009; Taylor 2011), but not at the level of State’s institutions, becomes here untenable. There is some kind of passage, however indirect and complex, between the forms of religiosity associated to influential social and political leaderships in the strike, and the effects on the State’s forms of government that the agreement that put an end to it is meant to have. How then do these religious discourses and practices become “inscribed” in the State? What other “theologico-political” structure is at play in this inscription, and how can one trace its differential ethical, political, juridical or social character and implications, in contrast with the other more explicit and defiant gestures in the decrees? I do not expect to elaborate on these issues exhaustively, but just propose two threads for reflection and possible further exploration. First I will mention them, and then I will try to leave open possible tentative paths for further elaboration and analysis. First, in the case of the notable leading role of certain Catholic pastoral practices in Buenaventura’s strike, it is perhaps useful to bring to mind Foucault’s notion of “pastoral power” in his genealogy of the governmental techniques that gave rise to, and consolidated in, the history of the modern State. Foucault’s notion of “pastoral power” is useful, and yet it is still limited in important respects to think through the modality of this “inscription” of a religious spirituality in the State’s forms of government that occurred in the case of Buenaventura’s strike. We will see why. The intervention in, and support of, the articulation of social and community organizations that came together in the Buenaventura’s strike mobilization (more than 50 of them in which one could count Cabildos Indígenas, Consejos Comunitarios Afros, Juntas de Acción Comunal), from the part of the Catholic Church’s hierarchies of Colombia’s Pacific region, is the expression of a long dated history of pastoral practices that have created relations, alliances and forms of collaborative work between the church and disadvantaged communities. This long history includes the consolidation of initiatives such as the “Pastoral Afroamericana,” the “Comisión de Vida, Justicia y Paz,” and the “Observatorio de realidades sociales.” All of them platforms from which the church has made efforts to come close to the needs and aspirations of the regions’ inhabitants, and work hand-in-hand with them towards the achievement of social transformations of these conditions. The theology that has served as an impulse for this pastoral practices configures itself out of an interpretation of the gospels as a claim of active and militant solidarity and care towards the harsh conditions in which the communities marginalized and socio-economically disadvantaged have to live in, at an inequitable world in which the social order is maintained to favor the interests of the power holders. And an interpretation of the figure of Jesus Christ as the enactment of a kind of love towards those hurt by an unjust social order that carries forth, hence, an unequivocal attitude of social and political inconformity and critique. That the gospels present Jesus Christ as a person who was critical of the social and religious reality of his nation of Israel. Jesus Christ felt a compassionate love for and solidarity with the most marginalized and excluded people of his age. He put himself in the world of the poor and from there, rebuked those who seek refuge in egoism and do not worry about or commit themselves to the weakest of their sisters and brothers. That from its origins, the Catholic Christian Church was the scene and experience of love and solidarity, because love is the only force which transforms people and communities. (Diócesis de Buenaventura 2017)3 (See Image 2). Source: Diócesis de Buenaventura 2017. Image2. Communication to the public opinion, 2017. The eight “structural” issues raised in the civil strike’s demands to the Colombian government refer to the need of improvement of the material conditions of livelihood with respect to health care, infrastructure, quality and access to education, resources for the promotion of cultural and artistic practices, among others. Only when, after eight days of strike the government committed itself to respond to these demands, the strike came to an end. Forces, affects, and a constellation of social and institutional relations and forms of organization and their texture, traversed by religious pastoral practices, ended up in this way inscribing themselves in a concrete and focused governmental strategy and program. How should we analyze the inscription of the religious in specific techniques and actions of State governance? We have insisted throughout this article on the need to find a more nuanced and complex analytical grid that allows one to conceptualize the inscription of the religious in the performance of the law, beyond the reductive assumption of political liberalism that tends to conceive of this inscription exclusively in terms of the explicit and overt appearance of religious vocabulary and ideas in the language of the law. Again, the example we are examining here requires us to advance in this same direction. In this case, there is a passage between certain forms of Catholic pastoral practice and certain governmental decisions induced and precipitated by the general strike convoked and organized by a network of grassroots platforms of social action, and instances of local communitarian self-governance. It might be useful to think of this fluid passage in counterpoint with Foucault’s genealogical account of the transformation of certain forms of pastoral power operative in the medieval Christian Church and the development of specific techniques and a governmental rationality in the historical emergence of the modern State (Foucault 1990). What is useful here is the displacement that this structure of the “theologico-political” in Foucault’s account provokes with respect to how to think of the relation between the religious and the political, not in terms of the relation between two institutions (the Church and the State), but in terms of the relation between specific techniques of power that are fluid and transformable. This is, techniques through which certain subjects assume the role of governing, leading and having an influence in other people’s lives and conducts. A relation between the religious and the political, hence, that passes through the resonances, continuities and discontinuities between the rationality of these techniques (lead people to what ends, through what means, in what way and why?). Another useful aspect of Foucault’s model of conceptualization of the theologico-political in the structure of the modern State’s forms of governmentality, is that it allows us to think how in these passages between forms of pastoral power and forms of State governance, entire affective constellations and specific techniques of conduct of the self and of conduction of others, emerging in religious discourses and practices, can get inscribed and installed in forms of State governance. In the case of the pastoral Catholic practices that had a notable influence in the Buenaventura’s strike, one finds affective constellations involving care, solidarity, love, compassion, indignation; forms of conduct, including brotherhood, courage, critical reflection on social and economic realities, the commitment to the shared destiny of the community, peaceful resistance against police repression, and forms of relation between the pastor -the religious leaders- and their people, comprising communal prayer, logistical support, spiritual advice. Forms of affectivity, of conduct and of relationship that make their way from certain forms of religiosity to the bending of the State’s specific decisions on public policy, in a certain direction. And yet, the “pastoral power,” to use Foucault’s terminology, deployed in this contemporary scene of social and political struggle in Colombia’s pacific region, diverges from the one he associates with medieval Christianity in several decisive respects. Most importantly, it is a form of pastoral power that doesn’t have the simultaneous “totalizing” and “individualizing” structure that Foucault finds crucial in his account. Even if there is a benevolent and abnegated form of pastoral practice, one aimed at the people’s spiritual and material well-being and salvation, and one in which the pastor finds himself in a sacrificial role; even if there are strong moral links between the pastor and the people that demand from them specific attitudes and conducts (active participation in the strike, peaceful resistance, a solidary disposition towards those in greater need, etcetera); even if this pastoral practice is oriented towards the enhancement and defense of people’s lives, this pastoral practice is not individualizing in the way Foucault describes Christian pastoral power. Salvation as a religious promise and aim is not an individual goal, but a communitarian one. It doesn’t require the movement of internalization through which the pastor’s subjects ought to “confess” and tell the truth about the movements of their souls, one that will later on be codified in the production of the theological truth regarding the subjects moral or spiritual health and condition. There might be a moral dependence on the pastor as source of example, inspiration, support, but this dependence doesn’t solicit at all an attitude of unconditional obedience to his advice, and furthermore, it doesn’t make of this obedience an aim in itself but rather conceives of it as part of a relation of cooperation, collaboration and collective action aimed at vindicating the communities experiences, memories, aspirations, in a path of struggle against the adverse conditions of the social order. It is not totalizing either. We should recall that for Foucault it is only this genealogical link between Christian pastoral power and the biopolitical governmental techniques developed in the modern western forms of Statecraft and government of populations, allows one to explain that “demonic” association between two distinct logics: that of the city’s unity through the totalizing medium of the law, and that individualizing one of the pastor and its people. But the form of pastoral care in the Catholic Church’s role in the Buenaventura strike, doesn’t conceive of the State, or for that matter, the divine law, as an instance of totalizing and homogenizing unity. This pastoral practice conceives of the law in a perspectival way: the “law” (divine or civil) is not impartial, it takes sides in a conflict that divides the social space and makes it impossible to characterize it in terms of an “all” (an “omnes”). Even if the mass media and social networks did not comment on the Catholic Church’s role in the Buenaventura strike as an instance of a religious inscription in the political and juridical spheres, it was noticed by the Colombian government and the central hierarchy in Bogotá, both of which condemned the Pacific coast Dioceses for an illegitimate “intrusion” in politics which compromised the neutrality the Church should observe as an institution solely devoted to moral guidance. Both agreed that the clergy in Buenaventura should not have taken sides in the social and political conflict there, naturally appealing to the normative stance of secularism: the idea that pastoral practices should restrict themselves to the “private” dimension of moral guidance, and not intervene in public conflicts about social justice or public policies. Again, the secularist progressive enlightened critics of the defiant juridical decree of Yopal’s major, fail completely to perceive how secularism as a semantic and normative figure can also be employed, as in this case, in order to counteract and neutralize transformative and emancipatory forces and political processes that vindicate the experiences and demands of the most disadvantaged of our social order. Secularism ends up being in this case a very conservative and inmunitarian stance in defense, certainly, of a threatened social order. But what is in this case the quality of this threat? Is it “violent” or “peaceful”? Is it in tune with the efforts of peacebuilding that should be a common civic duty in this “post-conflict” era? The organizing committee of the Buenaventura’s strike named itself the “Committee of the Civic strike for the right to live in dignity and peace in one’s territory” (Comité del paro cívico para vivir con dignidad y paz en el territorio). The collective political mobilization they lead was thought of as a necessary effort towards peacebuilding -reiterating the motto of grassroots social movements in Colombia since the beginning of the peace negotiations with the FARC, regarding a conception of “peace” that is not just the disarmament of the insurgencies, but the required social transformations that can revert the “structural” forms of violence that gave place to the emergence of the insurgencies in the first place. And yet, the appeal to secularism as a normative stance in order to condemn as inadequate or inconvenient the regional Dioceses’ active involvement in support of the civil strike, went hand in hand with an also long dated tendency from the political and economic elites in Colombia to stigmatize social protest, specially general strikes, by presenting them as covert military operations of the insurgencies that would be controlling everything behind curtains. This “hand in hand” relationship between secularism as a semantic and normative procedure, and even a governmental technique, on the one hand, and, on the other, a certain conceptualization of the dichotomy between “peace” and “violence” which asserts that the participation of religion in politics is an incitement to violence, is not at all fortuitous. It is concomitant to the metaphysical interpretative and evaluative schema based on hierarchical opposites that “secularism” as a normative paradigm feeds entirely from, and reproduces: reason vs. unreason, peace vs. violence, deliberation vs. affect, autonomous enlightened citizenship vs. heteronomous religious subjection; mind vs. body; culture vs. nature, and so on. The secularist indignant progressive critic that leashed against the evangelical right-leaning zealots behind the spectacle of the juridical decrees, fails to realize to what extent the evaluative and semantic schema on which his criticisms are formulated, might be operative in other scenarios like the one of the Buenaventura’s general strike we have been discussing, precisely as a technique of neutralization and disabling of transformative social and political forces, that vindicate the perspectives, experiences and memories, of the most disadvantaged. Reflecting about religion in terms of what he calls the “ambivalence of the sacred” which can play a role as a powerful peacebuilding force but also as a recalcitrant violence inducing one, Appleby (2000) makes a strong point with respect to how we should resist these dichotomies. He recognizes the extent to which the forms of religiosity committed to processes of peacebuilding imply forms of radical militancy that are no less radical than the ones in which religion becomes a force inducing violent conflict, counteracting thus the easy equation between privatized and hence “tolerant” religious experience vs. politicized and hence “radical,” “fundamentalist” and “violent” forms of religiosity. And still, the very notions of “peace” and “violence” are perhaps not interrogated and critically examined enough in Appleby’s work as much as they could be, so they remain being analytical and evaluative opposites. As Benjamin also clearly stated it, the general strike is an instance in which peaceful resistance and violence can imbricate themselves in very complex ways to the point of becoming hardly separable. Not so much because the peaceful general strike can turn violent in response to police repression (and yes, there was police repression against the people peacefully marching in Buenaventura). Rather, because police violent repression is a sign that there is something terribly threatening to the stability of the social order in the general strike. Benjamin’s extremely enigmatic notion of “divine violence” is perhaps an effort to recognize that in their very vulnerability the bodies that come together to march peacefully in the scenario of a general strike, and their voices, and their language, are dangerous, and they are dangerous because perhaps they mobilize a very distinctive kind of “violence.” What kind? It is a merit of Derrida’s thought to have allowed us to conceptualize this “violence” in the unresolvable ambivalence of the arbitrary impersonal “force,” or better still “play of forces” that stabilizes a certain semantic regime as dominant, but at the same time is constantly fracturing and threatening its stability. This “archi-violence” that Derrida associates to his notion of “writing” attempts to capture something about the historicity of language (the density at once material and immaterial of language as a historically situated reality), and about our condition of thrownness in it. This is why even if Schmitt is to a certain extent right, from Derrida’s perspective, when he insists that there is no law in chaos, it is also true that there is no law without a certain constitutive disorder, and far from being opposites, law and disorder can hold among them complex and mutually reinforcing interrelations (Comaroff and Comaroff 2006). It is my conviction that a democratic transformative pluralism in Colombia would strengthen itself by promoting a more informed and reflexive evaluation of the different ethical and political implications of diverse religious discourses and practices, instead of insisting on the antagonism between the religious and the secular, religious groups and secularistic perspectives. The divisiveness provoked by this antagonism that frequently frames the terms of the debates concerning the relation between religion and politics in Colombia, has contributed to a polarization of the social field in which the interlocutors have ceased to listen to each other in the destructive exercise of a reciprocal stigmatization. It is necessary to overcome this situation through a better understanding of the different political implications of diverse forms of religious experiences and practices, and the need of opening the public sphere to this kind of conversation in which forms of religiosity that are nonetheless having a significant political influence in our country, in extremely diversified ways, can express their political commitments and projects, give an account of themselves, and be heard and attended by people inhabiting other perspectives and vocabularies. This paper aims to be a modest contribution in this direction. * A first draft of this paper was presented at the workshop “Thinking Law and Violence with Jean and John Comaroff” organized by Esteban Restrepo and Julieta Lemaitre (with the support of the School of Law) at the Universidad de los Andes (Colombia) in October 2017. It was a privilege to be part of this space for challenging collective thinking, and I am most grateful to the workshop organizers for its clarity of purpose and pertinence, and to the Comaroff’s for their generous and gracious engagement with the participants. Parts of this paper are in close dialogue with the research project with the same title that was awarded a Fulbright Visiting Scholar fellowship for the academic year 2018-2019. 2The decree discussed above was rendered unconstitutional by the office of the country’s general attorney. 6“[…] en nuestra misión de pastores estamos atentos a escuchar la voz del pueblo de Dios que se nos ha encomendado, de manera especial nuestros oídos están abiertos a la voz de las víctimas del conflicto armado, de los desterrados” (Diócesis de Tumaco et al. 2010, 37).